It has been just over 100 days since the Battle of Marawi, the military siege that lasted five months, from May to October last year. The Manila Times reported in October that over 47 civilians and around 970 militant terrorists were killed. Conflict between the Armed Forces of the Philippines (AFP) and the coalition of Islamic State (IS) militants resulted in destruction of the city as a result of firefights, bombings and air strikes. The Economist wrote at the end of the siege last year that 1.1 million civilians were displaced because of this conflict. The United Nations Office for the Coordination of Human Affairs said last month that tens of thousands of civilians displaced in the conflict still need humanitarian help. 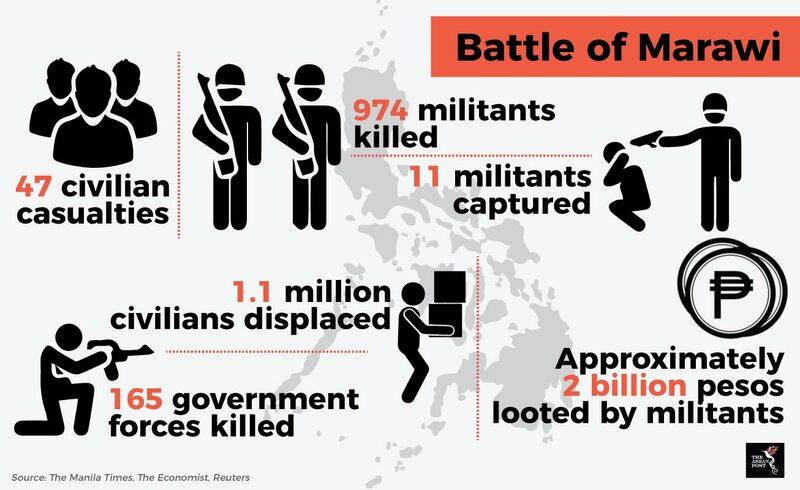 The Battle of Marawi began on 23 May last year, with clashes starting after an offensive by the police to capture Insilon Hapilon. According to the BBC, Insilon Hapilon is an Abu Sayyaf militant and is regarded as IS’ leader in Southeast Asia. He was also on the United States list of “most wanted terrorist”. The clashes then led to militants seizing buildings and taking hostages around the city. The militants are a loose coalition of fighters from different groups such as the Abu Sayyaf group, the Maute group and others who have pledged allegiance to IS. The conflict ended after five months with the deaths of militant leaders, Insilon Hapilon and Omar Maute. Currently, Mindanao – where Marawi is located – is still under martial law. Reporting in December last year, Filipino news organization Rappler wrote that the Filipino congress agreed to extend martial law in Mindanao to the end of 2018. Marawi is currently undergoing recovery with 2018 being declared the year of rehabilitation and restoration by the national government. The Filipino government has also gained support from the international community for their recovery efforts. ABS-CBN News reported that the EU has donated 850 thousand euros worth of humanitarian aid for the people, while the US has agreed to donate US$15 million. According to Philstar News, other countries that have given aid to the Philippines include Australia, Thailand, China and India. Despite foreign aid and recovery efforts by the government, many have raised concerns about the way in which the recovery is being carried out. The Inquirer reported earlier this month that recently Moro groups in Marawi City slammed the government’s plan to build a second AFP base camp in Marawi. The group questioned the government’s decision to spend money on building a military camp despite the fact that there are still 140,000 people displaced. Drieza Lininding, the Chair of the Moro Consensus Group has also voiced her concerns to the Inquirer that more military presence would instill fear among the displaced Maranao. This follows from Amnesty International’s report after the Battle of Marawi detailing human rights abuses by the militants and government forces. The report questioned the “…disproportionate use of air and ground attacks” by military forces. Dr. Steven Rood, a Visiting Fellow at Australian National University, recently wrote that urban rehabilitation is “…going to be long and contentious.” Dr. Steven pointed out that plans to develop infrastructure projects in Marawi such as the four-lane highway and promenades along Lake Lanao and the Agus River could lead to further displaced residents. Apart from that, there are also concerns that the terrorism threat in the Mindanao region is not completely eradicated. In a report by The Straits Times in October last year, IS have already appointed Indonesian, Amin Baco, as the new head for Southeast Asia. They also reported last month that the cash, gold and jewelry looted from the city have been used to recruit around 250 fighters. Speaking at the Yusof Ishak Institute Regional Outlook Forum 2018, Sidney Jones, the Director of Institute for Policy Analysis of Conflict also argues that the recovery process of Marawi is imperative to combat terrorism. Failure to do so would only benefit terrorist recruiters in the area. She stressed on the fact that the government needs to be as consultative as possible. While it’s been three months since the end of the siege, there’s still plenty of time to make the recovery process right. The Filipino government needs to take into consideration criticism directed at them while being cooperative and inclusive – otherwise there could be grave consequences. Do cryptocurrencies have a future in Southeast Asia?